1 Prepare Knorr® Rice Sides™ - Mushroom according to package directions, adding carrots during last 3 minutes of cook time. 2 Meanwhile, melt Spread in large nonstick skillet over medium-high heat and cook chops, turning once, until chops are done, about 6 minutes. Remove and keep warm. 3 Stir maple syrup, mustard and vinegar into same skillet and boil over medium heat until thickened, about 2 minutes. Add chops to skillet; turn to coat. 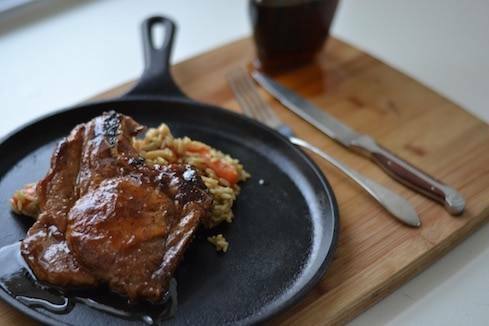 4 Serve glazed chops with rice and carrots.